Through my eyes. In my words. From my heart. In a year’s time, the Philippines has cradled in its wounded arms a ravaged, bereaved, distressed and deeply hurt but still somehow grateful and positively surviving Filipino people. For all those misfortunes that befell my country in the past year, I was a spectator. I saw how the Philippines struggled. I read about the massive losses we sustained as a nation. I followed the survival tales of my brethren. It is difficult enough to see them on the news; what more to hear them first-hand? Their pain consumes me. My deliberate attempt to look strong enough is almost always failed by the tears that threaten to fall. Sometimes, I feel as helpless as the victims,knowing that there’s only so much I can do. After all, who am I? A spectator. A woman who somehow knows how to write, maybe. A listener who does not even know half the basics of proper counseling. The lucky one. Yes, maybe I am that one lucky woman whom God could have easily put in the way of a bullet or a cyclone but didn’t. Instead, He made sure I see what’s happening. He wanted me to hear tales of survival which for me, more than anything, were stories of HOPE. So it is hope that I now wish to convey for it is where we will find reason to stand up from every fall and start our lives anew. It is hope that will see us through. December 4, 2012. Tropical cyclone Pablo wreaked havoc on rarely-hit areas in southern Mindanao. It displaced at least 80,000 people, left more than a thousand dead and around 800 more were missing. Being a Category 5 super typhoon, it made the Philippines “the most disaster-affected country in the world in 2012” (Sunstar 2013/04/08). 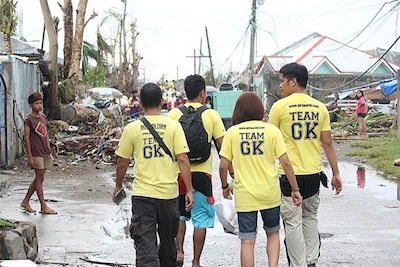 I was blessed to be part of Gawad Kalinga’s volunteer group who responded early on to carry out relief operations in the affected areas. I was then a first-time volunteer for typhoon relief so it was truly distressing for me to see people hold out their hand to us for food and water. I couldn’t watch them weep over their dead love ones who line the streets. It breaks my heart just seeing what’s left of their shelter. I thought I could do well holding back my tears in front of the victims until one day, I failed. On December 16, we were in the then-badly devastated land of Cateel for a medical mission so we attended the first of nine dawn masses to Christmas before the day’s work. It was held in a little chapel because the church itself was in ruins. Even so, the chapel only had a makeshift roof and it was so small, people had to literally squeeze in. In the middle of the mass, it rained so hard so we had to run to the sides to find the nearest shelter. Yet, in the end, people sang so gracefully the recessional song "Give Thanks". >> Read Arianne's article on her Typhoon Pablo experience: "A Thousand Smiles and More"
In the melody of their voices, my tears fell. Some wept silently. Some tried to sing even when their voices cracked, ending up in muffled sobs. Despite the calamity, the nothingness, the pain, hunger and thirst that the typhoon caused them, they were back before God to give thanks. Their faith lives on with the hope of a better tomorrow. September 9, 2013. 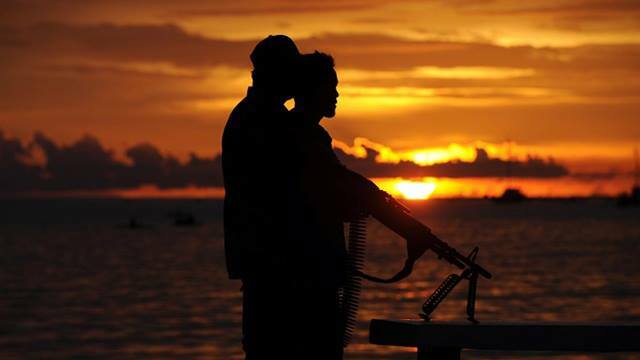 Zamboanga City was put under siege by a faction of the Moro National Liberation Front. The clashes displaced more than a 100,000 people; most of them huddled in fear at evacuation centers. More than 200 people were reported dead including civilians and armed men. It was only after about 3 weeks when military operations officially ended. While some people took the courage to go back to their homes, about 10,000 of them actually didn’t have any shelter to go back to anymore because they were destroyed at the height of war. People struggled to pick up the pieces left of their lives while wrestling with trauma. Their battle for healing and inner peace continued. As my heart aches for the civilians, I couldn’t help but fall in awe of our brave soldiers who fought for freedom. They were in the front lines, some running around with ill-fitted boots, eating food from cans, carrying weapons on their shoulders while sitting behind little covers deliberating their shots. The rebels, after all, were still humans. When the first of our soldiers was shot dead, I was almost in tears as I read his story. He died on his wife’s birthday, leaving behind not just her but a 2-year old daughter. Will he be just another person in the statistics? A hero without a name? Will the Philippines only know him as the first fallen soldier in the Zamboanga city crisis and not the soldier who helped set free 108 civilians from being human shields? I beg to differ. He and many others were not just fallen soldiers. They were our brave Filipino heroes that set Zamboanga free in their time of crisis. So I thought about those who lived through the war. What is it like to be spared from gunfire? The aftermath of war for a FILIPINO soldier does not only equate to the physical injuries he sustained in what once seemed to be a never-ending crossfire. It can be as complex as a lifelong psychological trauma from having harmed, or worse, killed an offender in the defense of his countrymen, from the worries he brought everyday to the battlefield when his defenseless family awaits his yet uncertain homecoming, from the fear of not being good enough in protecting his nation and its people while he struggles at the same time to preserve his life in the process and from having lost one, maybe even more of his once-cheerful comrades. The aftermath of war for him, more than his sore wounds, the sight of a ruined city and its traumatized citizens, is tantamount to a bleeding conscience, a heart full of grief, a feeling of insufficiency and a wounded spirit. 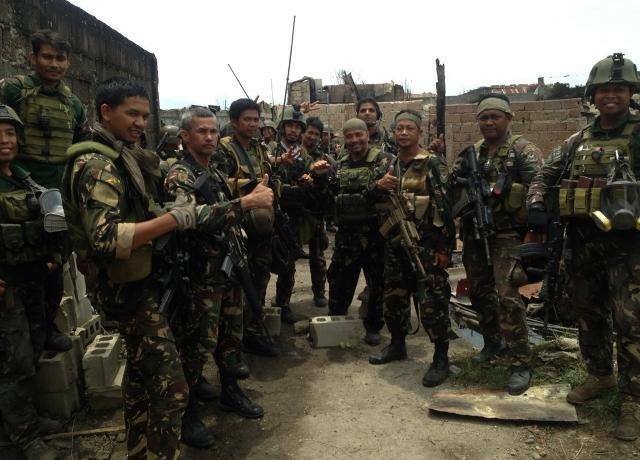 Nevertheless, our soldiers look back to us with smiles, knowing that they have fought for the good of the many even at the expense of their own lives. From their hard-fought triumphant smiles, I saw hope—something that even the ashes of war cannot conceal. Pugay kamay, mga bayani! October 15, 2013. The whole Central Visayas region was devastated by a 7.2-magnitude earthquake. It was so far the deadliest one that the Philippines ever experienced in the past 23 years. It killed 222 people and damaged more than 73,000 structures including the century-old churches which bear Bohol's cultural heritage. In the following days, around 3,000 after shocks were felt so fear was always fresh amongst the survivors. It left, yet again, thousands of Filipinos homeless, grieving and at a great loss. It was easy to lose heart and despise the heavens at that time, what with all the damage that the country sustained, not to mention the great misery that befell its people. Children were dead. Mothers wept. Men can barely watch their family starve while they themselves were as helpless. It was hard to just sit down and watch their struggles in the primetime news. It was even harder coming across opinions in the social media when people seemed so insensitive and indifferent. Oh how easy it should have been for me to pour out anger and disappointment at people. However, I chose not to by looking at the direction that Gawad Kalinga was taking in spite of everything. Suddenly, there's nothing I could say. I just could not put into words the kind of hope that GK is able to ignite in every weeping heart. Bohol is yet to rise again. 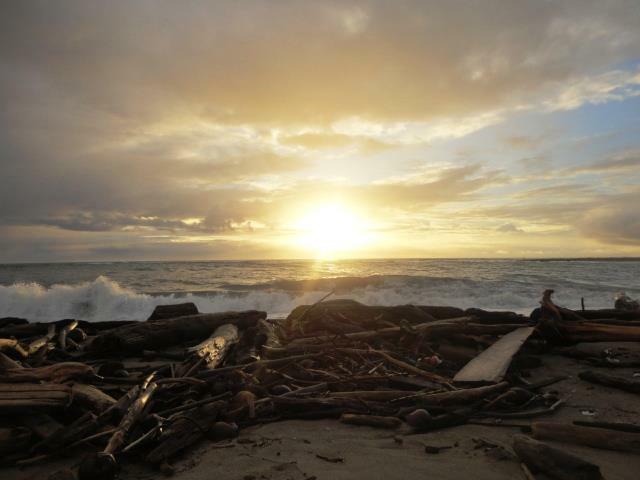 And while its people are finding strength to get back on their feet, GK comes to their aid, sitting with random people to hear their stories, playing with them, sharing laughter, and pointing out to them the direction of the sunrise. As I scroll though every GK story, their is always something that goes beyond every relief pack, treatment or shelter given; every GK story shines with a ray of hope. November 8, 2013. The strongest typhoon to ever hit land this year was lured, of the many countries in the world, to the Philippines’ little backyard. When Bohol and Zamboanga were still trying their best to get back on their feet after their hard luck, another disaster came to our midst. What a tough year we have, indeed! 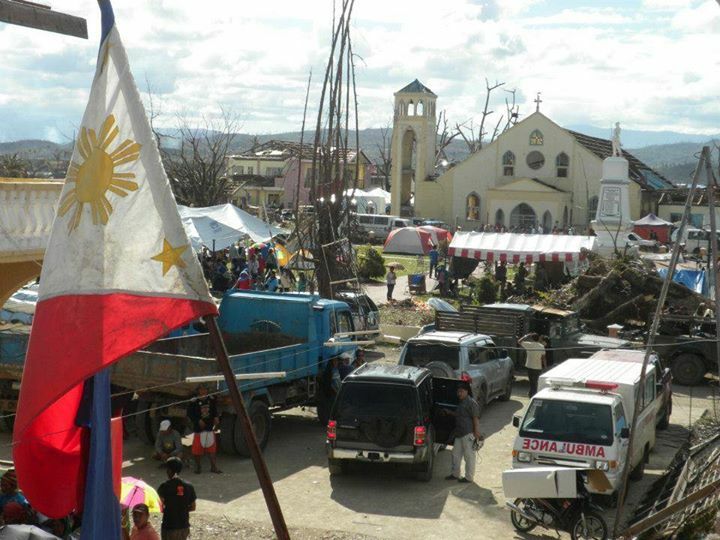 The Yolanda tragedy is a poignant memory for almost every Filipino across the globe. 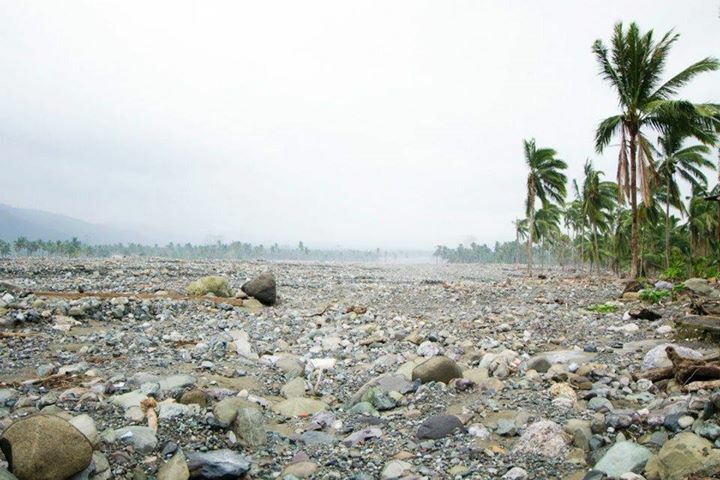 Misery just couldn’t get worse for the majority of people in Leyte and Samar islands. 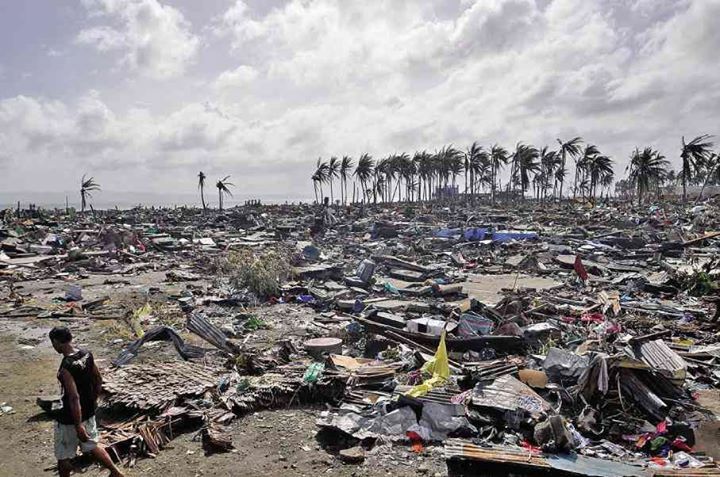 Even with all the preparations that the government has made, the typhoon was relentless from claiming thousands of lives and leaving roughly 1.9 million Filipinos homeless (Wikipedia®). For days, they inched through what seemed to be futile attempts of recovery. While roads remained impassable in the first few days, aid was not able to reach them immediately,leaving them to writhe in pain, hunger and cold, endure sleeping—if they could sleep at all—in complete darkness with their dead on the rubble, grieve helplessly and eventually making them succumb to violence and looting in order to survive. Through everyday news, the magnitude of destruction took shape in my imagination. I see the dire situation of people in my mind and that was terrible enough to even think about. However, I realized how I actually thought less when I saw with my own eyes what Northern Leyte really looked like only after 2 weeks when the super typhoon struck. It was far beyond what I imagined. As we drove through the weary streets leading to Tacloban, despair started to settle inside me and I couldn’t get myself to swallow the face of reality. How on earth can our people recover? Tears started to well up in my eyes. I badly want to go down from the van, walk around and perhaps comfort every person I meet on the street. But what will I tell them? Will I even find my voice after I have offered anyone a hug? What do I have in my pocket? A few bills and some coins—not even enough to feed a family in one week. I felt helpless. I tried my very best to guard my tears. It’s just so not me to break down on the spot and cry. The least I could do was to turn away from the window and avoid, even maybe for a while, the picture of disaster. And that was at that time a very good decision to make. By turning away from depression, I saw my fellow GK volunteers inside the van, just as silent, looking out their windows and maybe as disheartened as I am. Yet, in their presence, I felt a spark of hope. I looked out my window once again and by that time, I saw many others who, like us, are there to help. 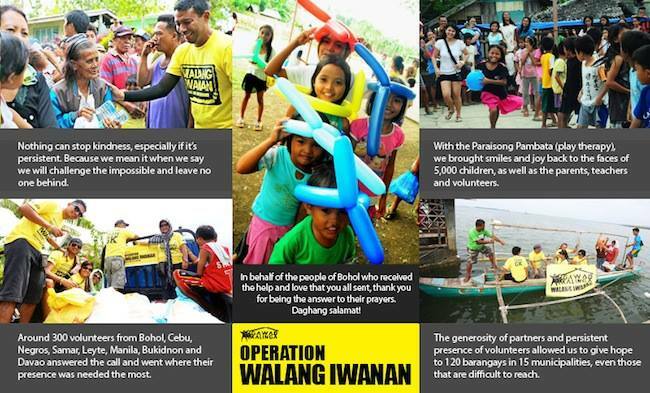 Volunteers around the world have come to help the Philippines find its way back in the light. Then it hit me. If I was there alone, I would not have made any significant aid. If I walked down the ravaged town alone, people could rob me of everything and still can’t put their lives back in order. 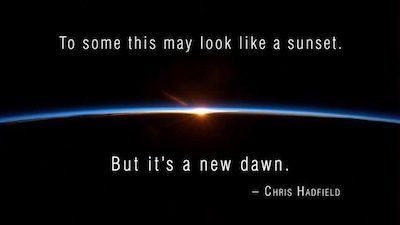 However, if we work together, we can surely make a difference. As long as there are people who care and share, and as long as we help each other, there will always be a hopeful tomorrow to look forward to. During our 7-day mission in Leyte, I was able to meet and see different kinds of people who in their own ways have started to cope up with what’s left of their lives; ordinary people who inspired me to carry on and do more. Before we even started our relief operations, I met an adorable 4-year old boy in Ormoc. His name is CJ. While we were having a meeting, CJ was looking at me from a distance with curious eyes. After the meeting, we ate lunch and he was still there, beside the door of the house,watching everyone including me. I waved at him and asked if he wanted to eat. He answered yes but didn’t approach me. Instead, he called his brother to get him food. After he ate, he was there again, standing beside the door so I called him and offered the seat beside me. Contrary to what I thought, CJ was such a bubbly 4-year old. I let him talk the whole time he was there beside me. He told me about people who came to play with them just recently. He said they made him draw so he drew the most beautiful girl in the world. I asked him who that was and said it was her mother. Such a sweet boy he was. There was no clear transition to CJ’s many stories. One moment he’s talking about drawings and the next, he’s talking about how the kids in their village ran for cover during the typhoon. He was even acting out the kids’ reactions. In the middle of our chat, I suddenly remembered that I had chocolates in my bag so I took it out and gave it to him. He was very happy. I asked if he found them delicious. He was about to answer me when his bright little face was suddenly in daze. “Hala…nag-ulan,” (Oh no…it’s raining) he said. I looked at the sky and it was only but a faint drizzle. “Hinay lang man ang ulan J. Dili man ta mabasa kay naa man ta diri sa sulod,” (It’s just a light drizzle, J. We will not get wet because we are indoors,) I told him. In a few moments he was silent then he started with his chocolate again. He said, “Mukusog mana. Mahadlok man ko.” (It will fall harder. I’m scared.) He continued munching on his chocolate but I knew then how greatly affected CJ was by the typhoon. CJ was so fond of conversations. He even narrated to us how he felt during the typhoon. He said he was scared especially when their roof was blown away by the harsh wind. “Wala diay ka nag-ampo kay Lord?” (Did you not pray to the Lord? ), a volunteer asked him. “Nag pray,” (I prayed), he answered. We laughed. CJ was such an insightful young boy. In his innocence, I feel utmost sincerity from a genuine heart. I saw in CJ’s eyes not only those who lived through Yolanda but also the many kids who survived Pablo, the Zamboanga siege and Bohol earthquake. He is for me, the face of every young Filipino survivor. Underneath his consciousness is a deep gash of fear from trauma but what actually lies deeper is his faith; his understanding that God answers his prayers despite everything and that he never was left behind. 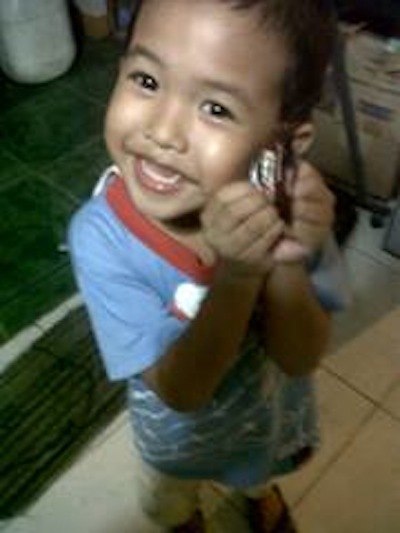 When he said, “Nanghatag pajud siya ug biscuit,” I was truly surprised. What does that mean? It means simply that God works His miracles through His people. It means that God has made me an instrument of His grace. It means, at that very moment, that we are part of God’s answers to the prayers of the Leyteños and CJ, as young as he is, was the one who made me realize that. The next day, we went to a secluded town in Ormoc which was just as devastated as those in the city. Only, they didn’t get as much aid. 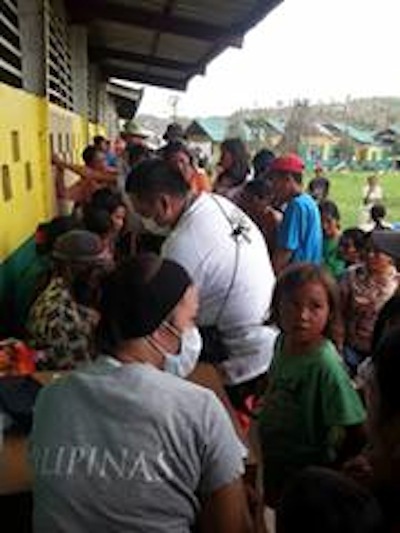 Aside from the distribution of relief packs and free charging of gadgets, we also ran a medical mission there. As a part of the medical team, I was assigned in dispensing medications. People literally swarmed around our makeshift clinic. We were having a hard time keeping up with the number of patients. It was a must to be fast and sure at the same time. While I was busy scanning a row of medicines, I noticed a woman who was also busy thanking every volunteer in the room. I glanced at her and saw that she was already holding her medicines and must be ready to go. 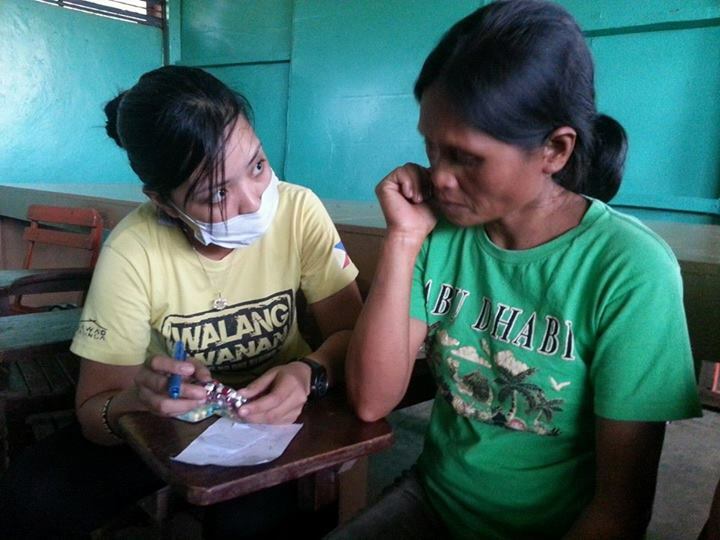 When I approached the woman beside her to give my health instructions, she turned to me and thanked me as well. “Salamat kaayo ma’am ha kay inyo gyud ming giadto ngari masking layo kaayo among lugar.” (Thank you very much ma’am because you really came here even if our place is too far.) She was smiling at me, eyes bright. I just answered, “Way biyaay ma’am,” and smiled beneath my mask. She addressed everyone with yet another ‘thank you’ and left. Honestly, I almost lost it with that woman who was going around and uttering her eternal ‘thank yous’. I’m sorry, but I really found her very distracting going around and getting everybody’s attention while we were all busy running here and there, catching up with the pile of prescriptions. However, the moment she turned to me and looked at me with much gratitude, I felt ashamed of my impatience. I realized that her gratefulness was actually not just for me. It was also for all those volunteers back at home who tirelessly packed relief goods. It was for every person who was able to share what they have, big or small. It was for the people around the world who sympathize with them. I was just a face who’s privileged to represent the kindness of a thousand more. I may never be the best volunteer but I just always want to be a good one. So at the spur of the moment, I suddenly felt it much appropriate to answer her with the message that everyone else out there would want to tell her, that is, “Way biyaay”. We're right behind you and we're not leaving anyone behind. 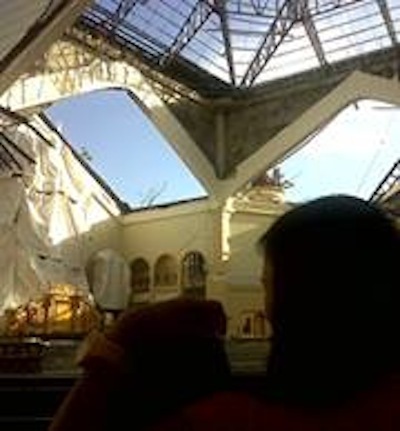 On Sunday, we drove to Palo, Leyte and arrived just in time for a mass at the cathedral. From where I sat, I was just about five rows from the altar and when I look up, the serene blue sky peeks through its roofless ceiling. The benches were already almost full when the mass started. Seated to the far right in the row in front of me was a man. I think he was around forty. He was alone. He sat at the rightmost part of the bench and to his left was an empty space. I noticed him because he was repeatedly wiping his eyes. At times, he would look at the kids seated far off his left side and that was when I saw tears falling from his eye. I looked away from him because I could not stand watching him weep. For all I know, maybe he lost a child. I looked at the blue sky above me. Lord, comfort this man. While I looked away from him, I was wrong to expect a lighter scenario. Random people were silently weeping as well, sobbing under their breath. I can hear them. I can see them. When we sang in unison “Ginoo, Kaloy-i Kami,” (Lord Have Mercy), soft cries became more audible. I had to look at the sky above me again so my tears won’t fall. Lord, comfort your people. And then I couldn’t help it anymore. My tears started falling. If there’s one thing I learned from this mission, it’s that hope lives. When I remember CJ, that grateful woman and the mournful man inside the church, I am reminded of how people continue to live through pain. It is difficult. It takes time. But while hope is alive, tomorrow awaits.